Whether you consider yourself a member of the natural health community, chances are, you’ve encountered Himalayan salt products. What exactly is Himalayan salt and what can it do for us? Authentic Himalayan salt is mined from the Khewra salt mines in the Punjab region of Pakistan, and is believed to be millions of years old. There are many fake Himalayan salt products on the market today, and in order to reap the full benefit of this therapeutic mineral, buying from trustworthy sources is important. Impure or inauthentic Himalayan salt will not be as effective, and may even be unsafe. Himalayan salt can be eaten, but it is also commonly used for decoration. It has a natural soft-pink coloring that many people find appealing, and the gentle glow it emits can help to create a warm atmosphere in the home or workplace. 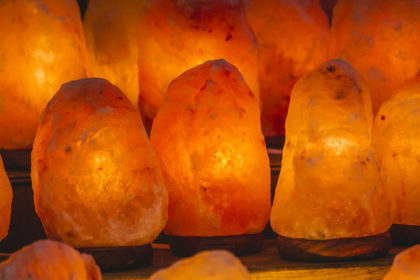 Their appearance makes salt lamps effective stress-reducing agents, calming your mind and body and encouraging a sense of harmony and wellbeing. With regards to natural healing, Himalayan salt is a natural ionizer, meaning it can alter the electrical current of the air around it. It is said to aid in air purification when exposed to a heat source, such as a flame or bulb, which disturbs the ionic bond holding the salt together, releasing negatively-charged ions into the air. Most harmful particles (such as bacteria, viruses, allergens, odors, and mold) have a positive ionic charge. Because positive and negative charges attract, these ions bind to one another, and the resulting particle is too heavy to free-float through the air, causing it to fall to the floor, where it can be removed with regular cleaning efforts such as dusting or sweeping. There have been a few small medical studies published in recent years citing the benefits salt therapy can have for individuals with compromised respiratory systems, such as asthmatics and smokers, due to its ability to cleanse the air of allergens and irritants. In addition to lamps, Himalayan salt products come in other forms, including candleholders, tiles, and soap-sized bars. A Himalayan salt bar can be used in the bath by first exposing it to the heat and steam of the shower, and running it over your skin after your primary rinse, for additional cleansing and exfoliation. Bricks and tiles can be placed throughout the home, or they can be used in the kitchen as grilling or serving plates. For anyone who would like to take the leap and begin incorporating this wonderful healing mineral into their daily life, Mystic Elements can help. We are proud to carry authentic Himalayan salt products in many varieties. Our staff is educated on the benefits and the specifics of each product, and can aid you in finding the solution to your individual needs.